096 - An old garden at Qila Mian Singh, Gujranwala. 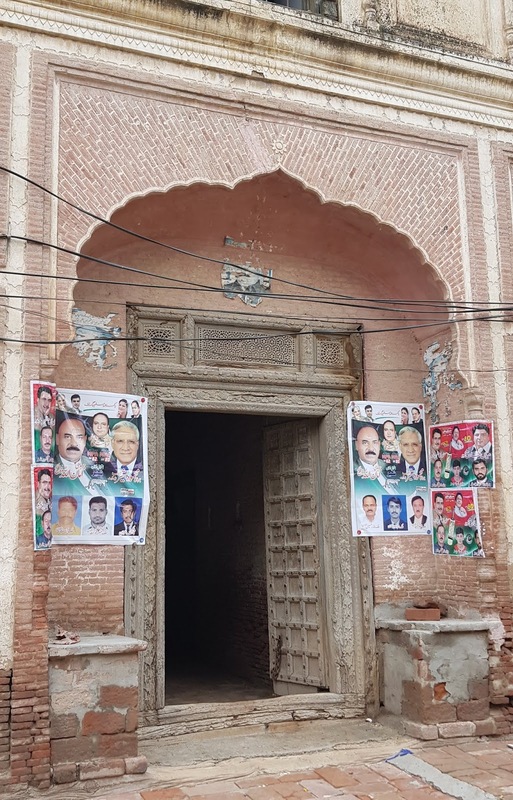 About ten kilometers from Gujranwala, there is a village known as Qila Mian Singh. Now word Qila in Arabic / Urdu / Punjabi means fort. So I thought there could be a fort or remnants of an old fort. 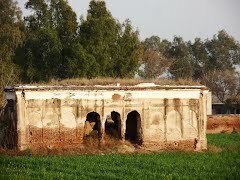 A search on the internet indeed showed some old structures in the village. To further probe into the matter I marked this place and finally reached there on 24th of July, 2018. I found no signs of any fort but a boundary wall of probably a garden still exists. It is a huge compound in a square shape, with each side measuring 150 meters, encompassing an area of over 5 acres. The walls are deteriorating and some portions have fallen. The land inside the boundary walls is now cultivated and there are no signs of any garden. It is at located at 32° 6' 0.09" N; 74° 4' 42.62" E.
However, two buildings or rather one and half a buildings still exist inside. One is probably a smadhi and the other is a portion of now mostly collapsed baradari. The above three pictures of paintings depicting different scenes of a story. Paintings of Kokila or Koyal, a bird representing singers. It was intriguing to see a graffiti in Hindi inside the samadhi, The word Ram is repeatedly written here. On the left side of the human figure, Dwarka Nath Dham is written. It is obvious that it was written much later. Most probably much after the partition and maybe not a very long time ago. But it is difficult to guest that who could have written it. It was more probable to find something in Gurmukhi, the script Sikhs use to write Punjabi. Anyway, Dwarka is a famous temple in Indian state of Gujarat and one of the four dhams or holy places of Hindus, the other three being Badrinath, Puri and Rameswaram. Word Ram is repeatedly written here. 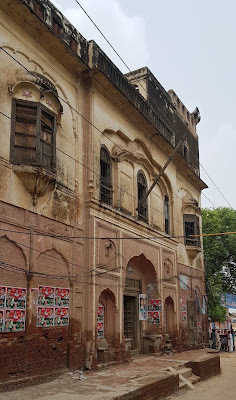 Mian Singh di Haveli inside Yakki Gate was taken over by the British in 1849. This modest ‘haveli’ belonged to the Sikh chieftain of the Sukherchakia Misl of Gujranwala, and Mian Singh had a stronghold there which is still named Qila Mian Singh, just near Qila Didar Singh. So it can be safely assumed that Mian Singh, a chieftain of Sukerchakia Misl, lived during the last half of the eighteenth century and due to his services was granted a jagir in this area. The power of Sikhs rose in this region in the 1760s. And perhaps he himself or his descendants built this huge garden, of which only a few traces survive today. But perhaps will not survive for long, because apparently it is not on the radar of any government department and there is no protection or maintenance. The above two pictures were taken by Mr Ijaz Ahmad Mughal, most probably just a few years ago and uploaded on Panoramio. 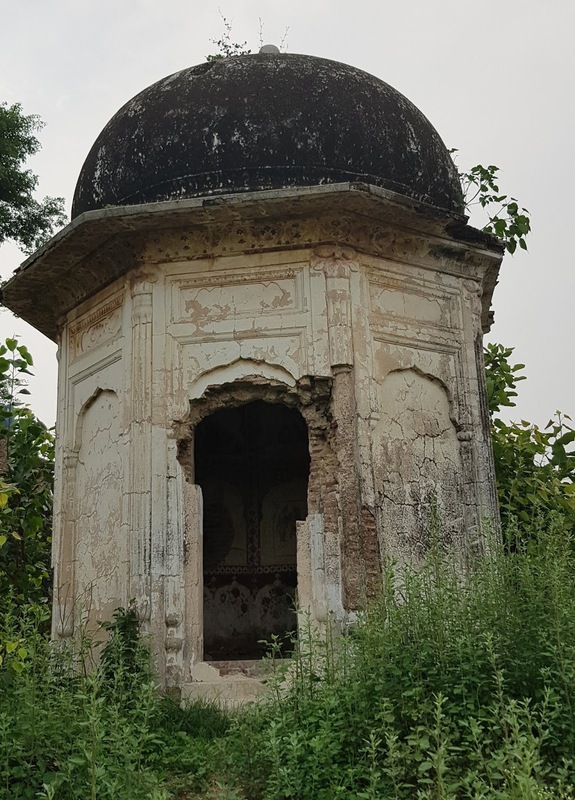 These clearly show the baradari in its complete shape. Now two thirds of it have collapsed. This show how bad is the condition and definitely, all traces will disappear very soon. At the end, I would like to thank my colleague, Mr Sameer Kashinath, who helped me in reading the graffiti in Hindi and understanding the paintings inside the Samadhi. Though this structure looks like a Samadhi, but in his opinion, it may not be a Samadhi because decorations were hardly allowed in a Samadhi. I hope some reader will add to our knowledge about this place. 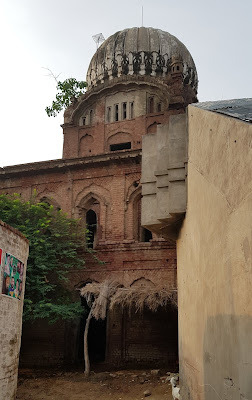 ِIn my quest for forgotten or "lost" places I reached a small town called Tatlay Aali, district Gujranwala, on July 22, 2018. I was looking for a Gurdwara known as Gurdwara Bhai Lalu Ji, in Tatlay Aali. But I was told that the gurdwara is in a nearby small locality Dinpur. It is a small village and everybody knew about the existence of this gurudwara. Anyway, it is such a lofty building that it can be seen from far away, though completely surrounded by houses. 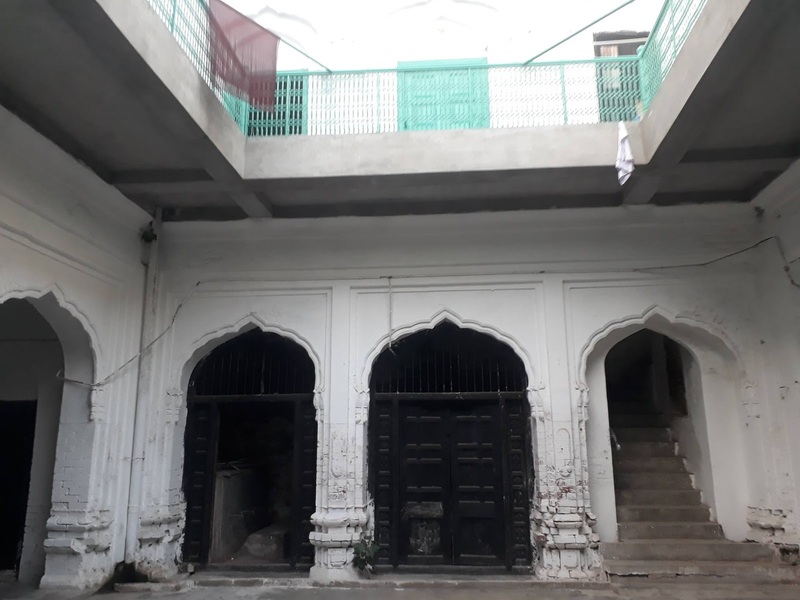 The gurudwara is located at 31°59'41.48"N; 74° 8'43.41"E.
Gurdwara Bhai Lalu Ji is in Village Tatlay Aali of district Gujranwala. This Village is situated on the road going westward from Kamoke and the Gurdwara of Bhai Lalu Ji is in the center of the Village. It was built in 1939 AD through the effort of Bhai Lal Singh Ji and the funds of Sikh Sangats settled in Africa. The building is 3 storeyed and has domes. At present Government Primary School is housed in it. 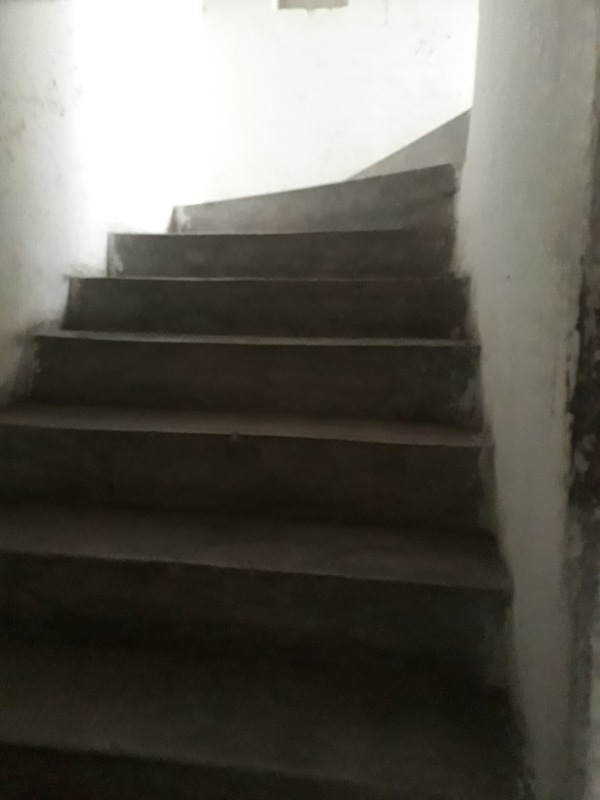 The building is strong but in the absence of maintenance its condition is deteriorating. As can be seen, the gurdwara though solidly built, is currently in a very bad shape. I think that the construction work stopped before its completion. Because I saw no traces of plaster on the walls, or tiling on the floors. Nor any other kind of decoration. So most probably the gurdwara was still under construction when 47 struck it. 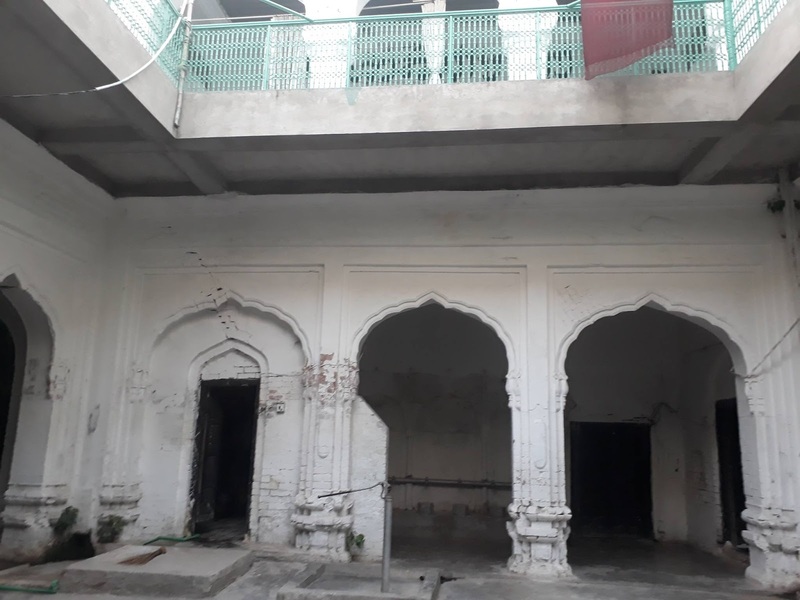 At present, the gurdwara is totally abandoned and being used by the local people as a pen for their goats and buffaloes and storeroom for fodder. It was indeed painful to see this state of negligence and apathy on part of the related authorities like Evacuee Trust Property Board or the archaeology department. Bhai Lalo earned his living by honest work. He was born in 1452 at the village of Saidpur (Pakistan). His father's name was Bhai Jagat Ram of the 'Ghataura' surname pertaining to the carpenter clan, now known as Ramgarhia. Bhai Lalo was nearly seventeen years older than Guru Nanak. When Lalo saw two holy men coming towards him, he put aside his work and spread a bed for them and went to get some lunch for them. As the kitchen was supposed to be the most pure and clean place in a house, Bhai Lalo asked Guru Nanak to come there and have his meal. Guru ji said “Bhai Lalo, every place is clean and pure for us. Please bring the meal here.” So the meal was brought out and Mardana then divided it into three parts and they all ate it together. “This meal tastes like nectar. What has been put in it?” asked Bhai Mardana. Guru Nanak replied “That was the sweet flavour of truthfulness and honesty that you tasted. This taste is above the tepid experience of worldly delicacies.” Guru Nanak taught the message of honest hard work as an essential part of ones duty to God. The other two important messages taught by the Guru were the remembering and reciting of God's nameand also the sharing of ones worldly wealth with others who are less well off. Guru Nanak took Bhai Lalo’s dry chapati in his right hand and Malik Bhago’s fried sweet pancake in his left hand. When he squeezed the right hand the people present there saw drops of milk dripping from it. And when he pressed the left hand with the Malik Bhago's fried pancakes, everyone saw blood trickling from it. “Look Malik Bhago, wealth gathered by cruelty and corruption towards the poor is like sucking their blood which you have done. You had invited me to partake of blood, leaving food pure as milk. How could I accept it?” said Guru ji. Malik Bhago was silent then. Bhai Lalo on the other hand was the symbol of honesty and hard work. So according to Guru ji it’s better to earn little money with honesty than to amass a huge wealth by devious and crooked means. The news spread that a Guru, who could challenge caste and authority, with such courage unknown before, travelled the countryside. More and more people came to listen to the enlightening words of Guru Nanak. Bhai Lalo was blessed by Guru Nanak Dev ji to spread the message of the Divine Name. He became a devout Sikh and preached the Guru's gospel to the people of Saidpur. One thing is not clear, did Bhai Lalu ji's has a connection with this place? 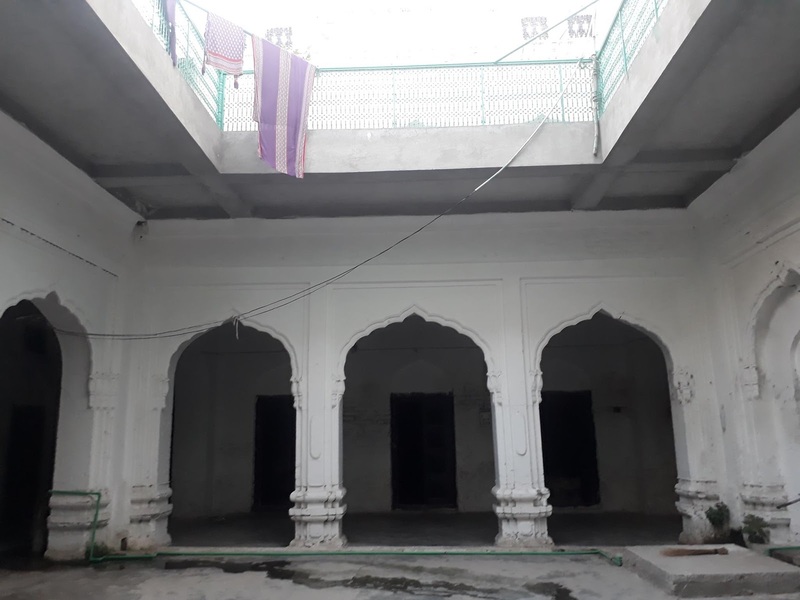 Why a gurdwara in his memory was built 13 kilometers away from his native place, Eminabad. Perhaps he had devotees in Tatlay Aali who built a gurudwara in his sacred memory. Concerned authorities should give this gurdwara protection and pay some attention to its repair and maintenance, otherwise, it will not survive for long. Gujranwala region was one of the earliest strongholds of the Sikhs in Punjab in the 18th century. 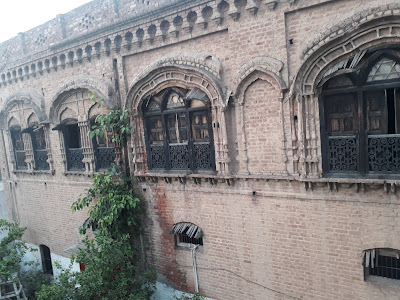 Its foundations were laid sometime around 1760, as the capital of Sukerchakia Misl by Sardar Charat Singh, the grandfather of Maharaja Ranjit Singh. During the long struggle of Sukershakias, spread over three generations, many soldiers of fortunes supported them and were amply rewarded for their services. 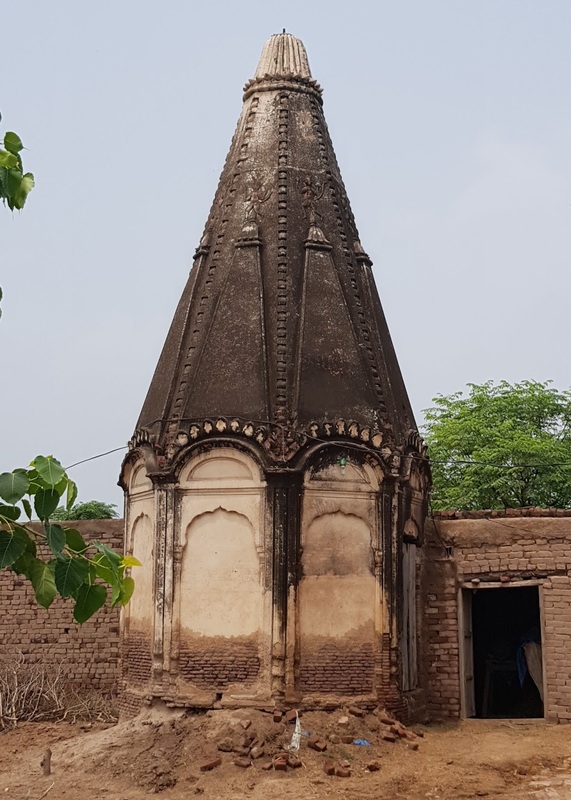 One Such family was of Sardar Jhanda Singh, whose ancestors were closely associated with the chiefs of Sukerchakia Misls and were given many jagirs in different parts of Punjab. He himself followed the steps of his ancestors and served the government of Khalsa Raj in Punjab at prominent positions. When the British annexed Punjab in 1849, he remained in favour and kept on cooperating with the new government. He died in 1883. His village is still called Butala Jhanda Singh, about 20 kms west of Gujranwala city. Sardar Jhanda Singh and his family were mentioned in detail by Major W.L. Conran, in his book "Chiefs and Families of Note in the Punjab", in the following words. 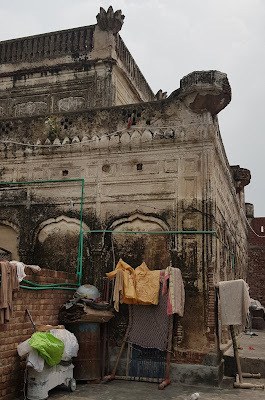 In the old days of the Muslim power, long before the Sikhs obtained possession of the Punjab, an ancestor of Sardar Jagjit Singh went to Pakpattan to visit a celebrated mendicant, probably Bawa Farid, who resided there, hoping to obtain an heir by the blessing of the holy man. For long he waited upon him and prepared his food, and at length obtained the blessing he sought. From this religious service he obtained the name of Bhandari, or steward, which still belongs to the Butalia family. Dhana Singh was an associate of Sardar Nodh Singh, and after his death served under his son, Sardar Charat Singh. He died in 1765 leaving two sons, Diwan Singh and Hiba Singh, who followed the fortunes of the Sukarchakia chief; and when the latter obtained possession of a great part of the Grujranwala district they came in for a fair share of the spoil, receiving Butala, Pahladpur, Kalsian and other villages. When Sardar Mahan Singh obtained possession of Ramnagar he assigned to Diwan Singh an allowance of Bs. 1,000 per annum from the salt duties, which was held by him and his descendants till 1848. Diwan Singh was murdered by his nephew, Ratan Singh, son of Hiba Singh; and his young son, Sham Singh, generally called Shamu. Singh, was summoned to court by the Maharaja and was confirmed in the possession of a part of his father’s estates. He rapidly rose to power rand received large jagirs, which at one time amounted to Rs. 50,000. He was called Kunjahia, from Kunjah in the Gujrat district, one of his jagirs. Sham Singh was killed at the battle of Baisa in 1813, being then twenty-seven years of age. The Maharaja treated his young son, Jhanda Singh, with great kindness, but in 1819 resumed the jagir of Kunjah, giving him in exchange Sihari in the Sialkot district. Jhanda Singh’s 'first inilitary- service was in Punch, where Diwan Dhanpat Rai and Mir Baz Khan had been giving trouble, and shortly afterwards he was ordered to Hazara. He accompanied the Maharaja in the campaign of 1821-22, when Mankera and Dera Ismail Khan were taken, and received for his gallantry valuable presents. About this time Jhanda Singh married his sister to Sher Singh, son of Sardar Hukam Singh, and a lakh of rupees was spent on the occasion by either party. Never since has so splendid a marriage taken place in the Gujranwala district. Ranjit Singh, who had heard of the festivities, and that the mother of Sardar Jhanda Singh had boasted of possessing two Bharolas* of rupees, sent for Hukam Singh and Jhanda Singh, saying that as they could afford to spend so much on a marriage, they must each find it convenient to pay Bs. 50,000 for the good of the State. *^ A Panjabi word for a large basket of clay and wicker-work, generally used for -storing grain. Sardar Jhanda Singh’s chief services were on the frontier, in Cliach, Peshawar, Yusafzai and Hazara. He was a man of energy and ability, and the Maharaja showed his appreciation of his character by giving him charge, under Sardar Hari Singh Nalwa, of the most nnruly part of the country. 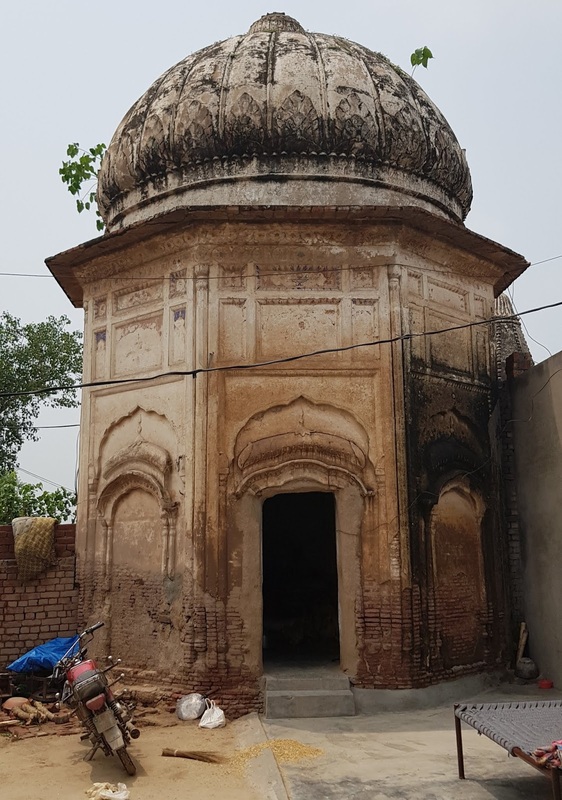 His services here were numerous and important, and are detailed in a sanad of 1834 under the seal of Nao Nihal Singh, by which the villages of Butala and Pahladpur are granted to Jhanda Singh and his heirs in perpetuity. In 1836 Jhanda Singh accompanied Prince Nao Nihal Singh in his Derajat expedition. During part of the Kabul campaign he was Governor of fort Attock, and was able to give assistance to the British army in the way of supplies and carriage. The fortunes of Sardar Jhanda Singh were not much disturbed by the many revolutions which occurred after the great Maharajahs death. When Sher Singh ascended the throne his affection for Ganda Singh, cousin of Jhanda Singh, caused the latter to become influential at Court, though Sher Singh only added Rs. 600, which he soon afterwards resumed, to his jagir. By Sardar Jawahir Singh, Jhanda Singh was made Adalti, or Chief Justice of Lahore, in conjunction with Diwan Hakim Rai, and held office till the close of the Sutlej campaign. In 1847 he was sent to Hazara as Naib Nazim, or Deputy Governor, under Sardar Charat Singh Atariwala and Captain Abbott, and in November of the same year he received, at the suggestion of the Resident, the honorary title of Bahadur with the affix Ujal Didar, Virmal Budh, meaning ‘ open countenance and pure mind In May, 1848, soon after the outbreak at Multan, it was determined to send a Sikh force down the Sindh Sagar Doab to aid in drawing a cordon around the city to prevent the spread of rebellion, and Jhanda Singh selected to command the force. His conduct on this occasion was admirable, and Captain Abbott wrote in high terms of him. Not very long after this, part of the Charanjit regiment of horse under the Sardar’s command joined the rebels, and Abbott began to entertain doubts about his loyalty. He had been, at his urgent desire, sent with his force to Multan; but when within a few miles of the city he was recalled by the Resident, much to his own disappointment, as his inclination ever carrried him where blows were thickest. The influence which Jhanda Singh possessed over Sardar Charat Singh, Governor of Hazara, was very great; and in August, when that chief was fast throwing off all pretence of loyalty, Jhanda Singh was sent with a confidential agent Gulab Singh, son of the governor, to endeavour to recall him to sense of his duty. He was totally unsuccessful, and at the time most thought that he was willingly so, and that he had done his utmost to widen and not to close the breach. But in those days the best men were suspected, and no one knew whom to trust. The Sardar was ordered back to Lahore and placed under arrest, but he was soon after released; and during the last four or five months of the war he and his ,sowarss kept the road open between Lahore and Ramnagar, and thus performed most valuable service. No proofs of duplicity or disaffection on Jhanda Singh's part have ever been forthcoming; and he was unsuccessful with Sardar Chatar Singh, because another and a stronger influence was urging that chief to rebel. On annexation all the personal estates of Sardar Jhanda Singh, amounting to Rs. 15,560, were confirmed to him for life. To his eldest son, Nihal Singh, Rs. 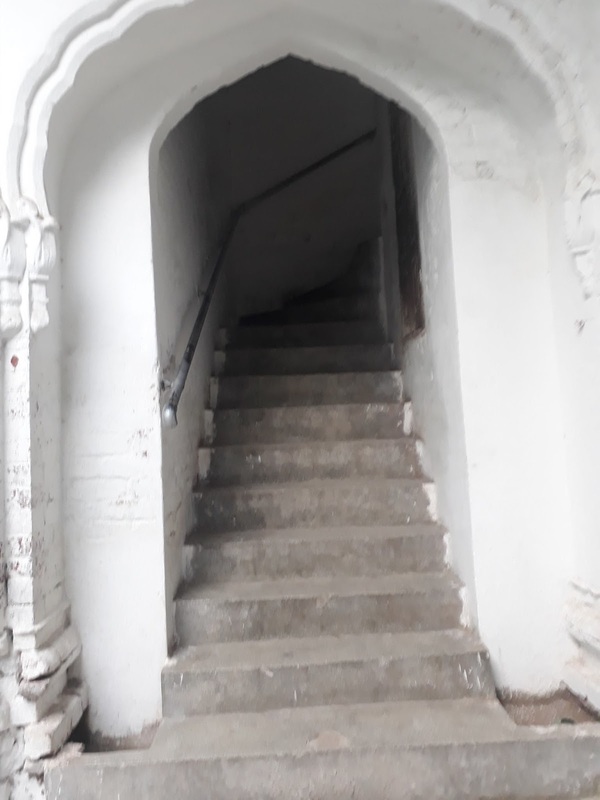 3,550 of the above estate was to descend for life, but Nihal Singh died in January, 1864; and his younger brother, Mahtab Singh, who died in 1885, only received Rs. 500 per annum, with the exception of the jagirs of Butala and Pahladpur, worth Rs, 1,500, which were upheld in perpetuity. 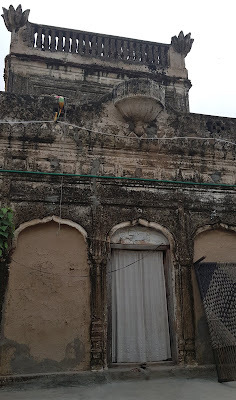 Sardar Jhanda Singh lived at Butala, Gujranwala. He was appointed a jagirdar Magistrate in 1862, and possessed considerable influence in the district. He was well known as a liberal and enlightened gentleman. He expended about Rs. 25,000 upon public bathing-tanks, dharamsalas and other benevolent works. He died in 1883, regretted by all classes. Of Jhanda Singh's life jagirs, a portion, valued at Rs. 2,000, less a nazrna deduction of one-fourth, together with the perpetual jagir grant of Rs. 1,500, was sanctioned to his heirs, namely, to his grandson, : Sardar Balwant Singh, and his sons, Mahtab Singh and Mul Singh. Sardar Balwant Singh's father had been commandant of one thousand horse under Prince Nao Nihal Singh in the Chaharyari Dera, with a jagir of Rs. 3,550 in Chapal and Kot Shah Muhammad. This jagir, included in his father's estate, lapsed on Nihal Singh's death in 1864. His son, Balwant Singh, was allowed a life grant of Rs. 1,200 per annum in the Gujranwala Tahsil and later on, when his grandfather died, enjoyed a further grant as already stated. He owned 2,000 ghumaons of land in three Tahsils of the Gujranwala district, yielding an annual income of about Rs. 1,500. Besides this he was granted seven squares of land in the Samundri Tahsil of the Chenab Colony and he founded a village called Kila Balwant Singh after his name, in the Hafizabad Tahsil. He spent a large sum of money on public buildings, opening a charitable dispensary at Butala at his own expense. He was for many years an Extra Judicial Assistant Commissioner. He retired on pension in 1908 and was the second Provincial Darbari in his own district. He died childless in 1915, leaving property worth many lakhs, a part still being administered by a trust created by him, for running a girls' school at Gujranwala, for the dispensaiy at Butala and to provide the scholarship of Rs. 200 per mensem for higher technical and scientific education to be obtained abroad by a Sikh youth. 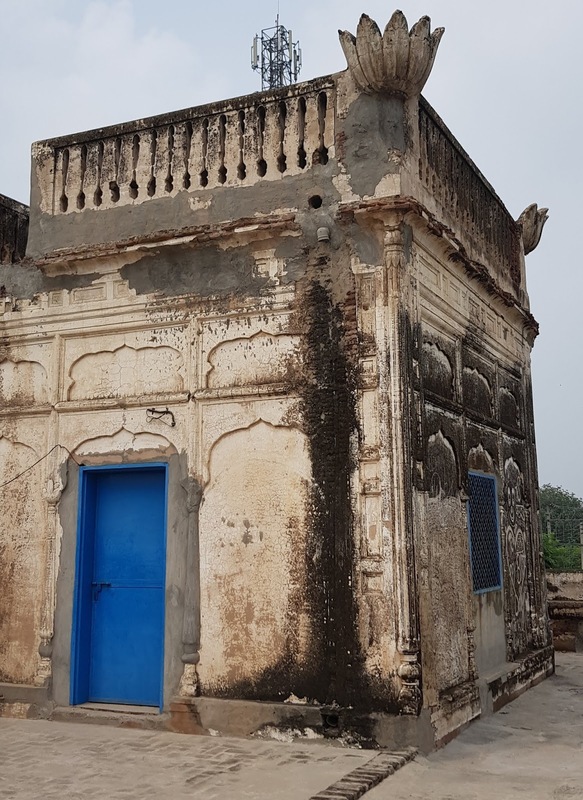 The rest of the property is at present being managed by the widow of the late Sardar who left instructions in ,his will for the adoption of a son from the descendants of his cousin, Sardar Arjun Singh. The jagir vested in him was granted in half to the sons of Sardar Arjun Singh and to Sardar Mul Singh, respectively. Arjun Singh with his brother, Suchet Singh, was allowed a jagir of Rs. 1,810 in succession to their father, Mahtab Singh, who died in 1885, after having been an Honorary Magistrate and Civil Judge for many years. They owned 1,200 ghumaons of land in the Gujranwala and Wazirabad Tahsils. Sardar Arjun Singh was a Zaildar at Butala, a Divisional Darbari and a member of the District Board. He was granted five squares of land in the Lyallpur Tahsil. He died in 1914. Suchet Singh was employed in the police till his death in 1906. His jagir was assigned to Arjun Singh. Mul Singh, the youngest son of Sardar Jhanda Singh, was a Tahsildar. He owned about five thousand ghumaons of land in Gujranwala, in addition to twenty squares of land in the Jhelum Canal which he bought for one lakh of rupees. He died in 1919. Sardar Arjun Singh left behind five sons, the eldest of whom Jagjit Singh, may now be considered as head of the family. He has conserved his resources carefully and is a public spirited gentleman. He is Honorary Joint Secretary of the Sikh Sardars Association and a member of the District Red Cross Society, the Khalsa Educational Council, the Prisoners’ Aid Society and various other bodies. During the Great War Sardar Jagjit Singh provided recruits and has since been assisting the administration in various ways. He is a jagirdar and a Provincial Darbari and is exempted from certain provisions of the Arms Act. His brother, Shivnath Singh, is an Assistant Sub Inspector of Police in the Montgomery district. After the death of Sham Singh in 1813, his brother, Dharam Singh received a portion of his jagirs. He served at Multan, Kashmir, Peshawar and in other campaigns; and when he grew old, the Maharaja, resuming his jagirs, gave him a cash pension of Bs. 2,000, and placed his son, Ganda Singh, with Prince Sher Singh, who gave him a jagir of Rs. 8,000 from his own estate. Ganda Singh was a great favourite of the Prince, whom he accompanied to Yusafzai, where he was wounded and afterwards to Kulu. When the Prince was Nazim of Kashmir, Ganda Singh held both civil and military appointments under him, and was employed to reduce the Rajas of Bhamba and Khakha to obedience. He afterwards served at Naushehra and Bannu. When Sher Singh ascended the throne he gave to Ganda Singh additional jagirs, worth Rs 30,000, about Butala and appointed him to the command of Orderly Dera. He was with the Maharaja when he was assassinated, and was severely wounded in the endeavour to defend him. He was killed in December, 1845, at the battle of Ferozeshah, where Kirpal Singh was also wounded. A short time previously he had introduced his sons Kirpal Singh and Dayal Singh, to the young Maharaja Dalip Singh and had obtained for them a jagir of Rs. 12,000. Shortly afterwards, however, the jagir was reduced to Rs. 6,000 by Raja Lal Singh. Sardar Kirpal Singh was at Hazara at the time of the Multan outbreak and he remained faithful, acting under the orders of Captain Abbott, while Dayal Singh was at Lahore in attendance on the Maharaja. Sardar Kirpal Singh resided at Kunjah, about six miles from the town of Gujrat. He was a Divisional Darbari. He died in 1901 without issue but had adopted Raghbir Singh, his grandnephew. Of his brothers^ Sardar Dayal Singh, known as Kunjahia, took up his abode at Wadala in the Sialkot district and acted for some time as Vice-President of the District Board. He was appointed Honorary Magistrate and Civil. Judge and his name was on the list of Provincial Darbaris. He had six squares of land in the Lyallpur Tahsil and enjoyed a jagir of Rs. 2,500. Sardar Partap Singh was an Extra Assistant Commissioner in the Punjab on a salary of Rs. 9,600 per annum. He retired on. pension and died in 1905. He owned the village of Sajada in TahsiL Hafizabad, a portion of Naushehra in the Siailkot district and had purchased several irrigated plots in the Gujranwala and Wazirabad Tahsils and 14 squares of land on the Jhelum Canal. He was a Provincial Darbari. In recognition of his services the hereditary title of Sardar was conferred on his eldest grandson, Raghbir Singh, whose property and that of his brothers, as they were minors, remained under the- management of the Court of Wards. Their jagir was worth Rs. 600. Sardar Partap Singh’s grandsons, Sudh Singh and Bahadur Singh died in 1912 and 1918 respectively. Their brother, Budh Singh, served, for a time as Aide-de-Camp to His Highness the Raja of Faridkot. Along with his nephew he now holds 3,500 acres of land besides an annual jagir worth Rs. 600. He is a member or office-holder of several district committees and is a public spirited gentleman. He contributed to various funds in aid of Government. Sardar Budh Singh is a Divisional Darbari and is exempt from certain provisions of the Arms Act. For the last 15 years he has been serving as Honorary Magistrate and, at present, he exercises 1st class powers both as Magistrate and as Civil Judge. Jwala Singh, the fourth son of Ganda Singh,, had lands in the Wazirabad Tahsil yielding about Rs. 2,000 per annum. He resigned his post of Honorary Magistrate in 1884, but his name remained on the Provincial Darbar list until his death. Ajagir of about Rs. 635 was assigned to his sons, Sardul Singh and Gurbakhsh Singh after his death, and they took up their abode at Wazirabad. Gurbakhsh Singh has since died. The four sons of Sardar Gaanda Singh jointly enjoyed a nominal jagir income of Rs. 10,000 per annum, secured to them under order of the Supreme Government in 1850. It was made up of the revenues of eleven villages in Tahsil Daska, Sialkot, and of two villages in Gujranwala, but a considerable portion was resumed on the deaths of the original grantees. Hari Singh, brother of Sardar Ganda Singh, died in 1886. His son, Ladha Singh, enjoyed a reduced jagir income of Rs. 185 per annum, in addition to Rs. 400 derived from nine hundred bighas of land in Sialkot. Wasakha Singh, son of Sardar Dayal Singh, was at first a Naib-Tahsildar and then lived on pension. Of his songs Jawahar Singh was a Tahsildar and gave the income of his jagir to the War Relief Fund till the termination of the Great War. Of his six sons, the eldest, Sardar Harbans Singh, was an advocate at Lahore and is now Deputy Chief Police Officer in the Nabha State; the second, Dr Baldev Singh, was a medical officer in the North Western Railway and was killed at Quetta in the Earthquake; the third son, Sardar Harcharn Singh, is a Sub-Judge at Amritsar. Jawahir Singh’s branch are permanently settled in Lahore. His brother, Gurmukh Singh, died in 1907, leaving a son, Gurbachan Singh, who is a Divisional Darbari and is employed as an Inspector on the North-Western Railway. Two members of this large family occupy some position of significance. One is Sardar Bakhshish Singh, the only son of Sardar Mul Singh. He is a Divisional Darbari and an hereditary Sardar. He is a life member of the Red Cross Society and one who has been contributing liberally to various public funds. The second is Sardar Iqbal Singh, brother of Sardar Jawahir Singh above mentioned. He is a retired Tahsildar, with a record of distinguished and meritorious service to Government behind him. In particular, he did very useful work during the period of the War both in his official and in hi private capacity, and raised large subscriptions for various funds and for providing recruits. For the whole period of that campaign he contributed Rs 200 annually out of his own jagir. He possesses numerous certificates from British and Indian officers, all bearing testimony to his vigorous efforts in connection with the War. He also did good work in connection with the disturbances of 1919 and the various Sikh agitations which occurred during the period of his service. Sardar Iqbal Singh has recently been employed as Revenue Assistant in Patiala State. 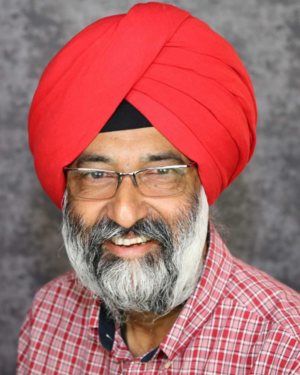 His son, Inderjit Singh, a graduate of the Government College, has recently been granted the King’s Commission. his book was published in 1940, so we do not find details of this family beyond this point in this book. However, there is one source, a descendant from this family. But I shall come to that later on. First, let us visit the homes belonging to this family still found in Butala Jhanda Singh. Actually, there are many houses belonging to Butalas. On 24 July, 2018, I reached Butala. I thought that at the most I would find a few ruins, in the last stages of decay but what I found there was beyond my expectations. First I saw a splendid house built in the traditional style of Punajbi architecture. Probably built around the turn of the 20th century. I was able to enter one of the houses and was so warmly received as if I were a close relative visiting them after a long absence. Regrettably, during my very brief and chaotic tour of Pakistan this summer, I misplaced the name of the owner. Who himself migrated as a young child from Hoshiarpur district in 1947. Now he lives there with his extended family of three sons and grandchildren. His wife too was very kind to us. There are actually at least three houses. The first, which I was able to enter, will be referred to as Haveli A and the other two houses across the street, shall be mentioned as Haveli B. 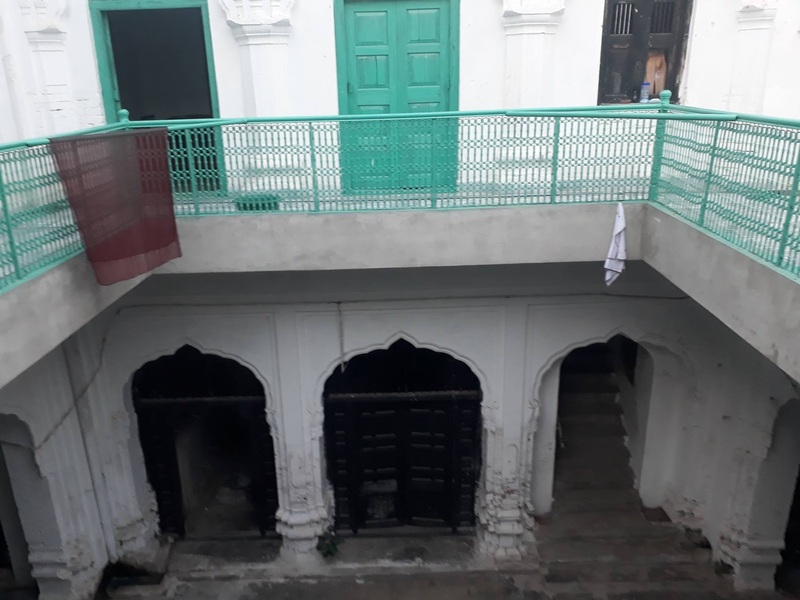 As I mentioned above, in front of the have I visited first (Haveli A), there is bigger haveli, probably two or three adjoining houses. I could not enter it, because in the main section a religious school for the girls is currently housed. And I could not find any relevant person to get permission. Now I am regretting my haste, which arose due to lack of time. I feel that this was the house of the main family of Butala clan. I suspect that a section of this cluster of havelis have probably been demolished. Just outside the village, there are two buildings of the same era. One is clearly a Hindu temple and the other is most probably a Samadhi. As mentioned above, in the introduction of the Butala family, they possessed magisterial powers also. People informed me about a building, where the court was held and the decisions were made. 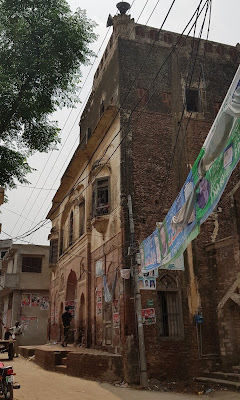 This building is square in shape, like a Baradari and is still in a strong condition. 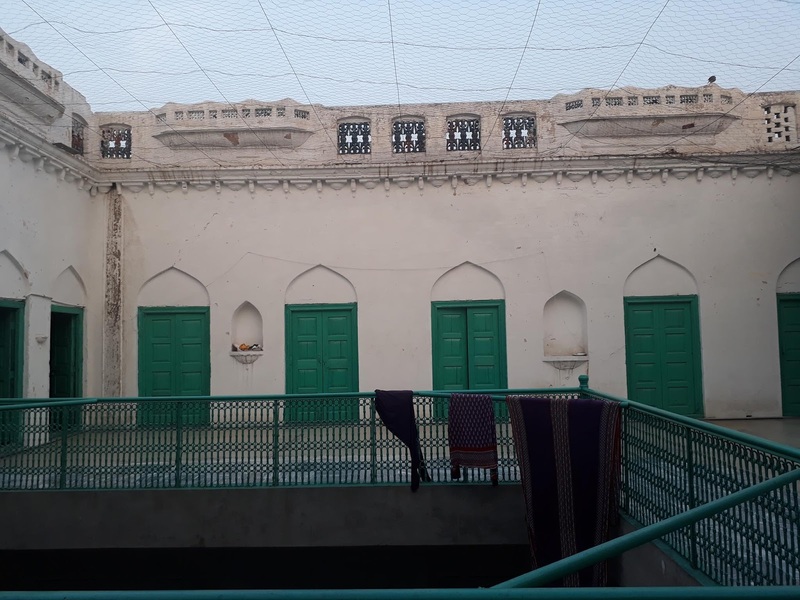 But it was very disappointing to see it occupied by many families and moreover, surrounded by all sides, by newly constructed rooms and walls. 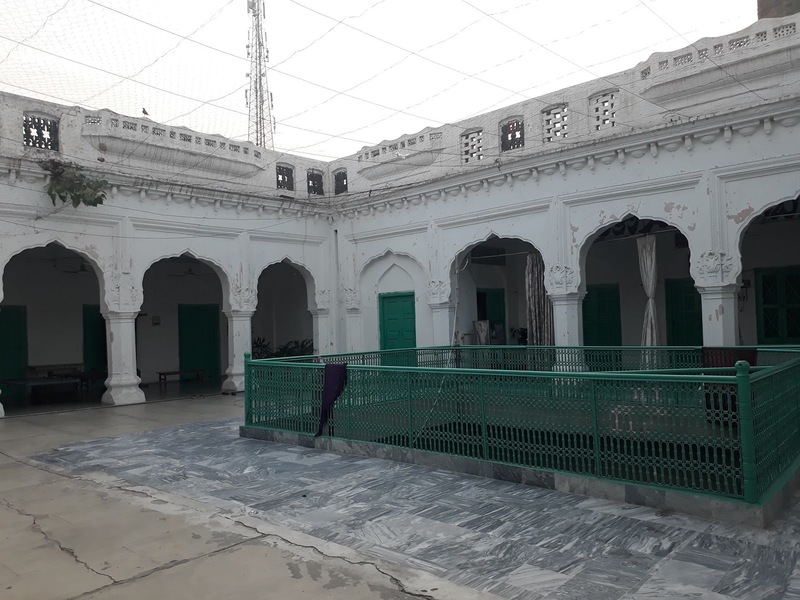 It was obvious that the people, who migrated from India in 1947, took shelter here and with the passage of time, constructed additional structures, adjoining to this large building. The building is so totally surrounded that it is impossible to take a good picture. However, the occupants are cooperative and let inside to explore the building. In its original form it was probably a big hall or a few big rooms, surrounded by veranda on all the four sides. Now the arches of the veranda had been closed to make additional rooms for the residents. It is difficult to say how old is this building. But most probably it was built during the 19th century. As a kid growing up in North India I was thrilled whenever both my parents went out since I would have the full attention of my frail and ageing grandmother. She doted on me - I could do nothing wrong and my sister could do nothing right! I relished the freedom to do anything under my grandma's watchful eyes. As I have grown from being a kid to a man, what I most fondly remember of her is not only her unconditional love but the stories she told me. Let me share a true story that has had a profound effect on me: the day my grandparents left our ancestral village for good. By the early 1800s, my ancestors had accumulated 42 jagirs (feudal land grants), making them one of the largest landholders in Punjab, South Aisa. "Batali" in Punjabi means 42, hence the family village was referred to as Butala, now a small village situated about 15 miles west of present day Gujranwala, Pakistan. Our family name "Botalia" or "Butalia" thus became common. Then August 15, 1947 arrived - the partition of India and Pakistan. Despite Gandhi's non-violence philosophy, the partition resulted in about 15 million people divided along religious identity-lines. This multitude had to cross from one side or the other. About half a million died in revenge killings as Sikhs and Hindus moved from Pakistan to India and Muslims moved from India to Pakistan. The carnage was equally horrific on both sides. It was, as my grandmother said, "the day we lost our humanity". 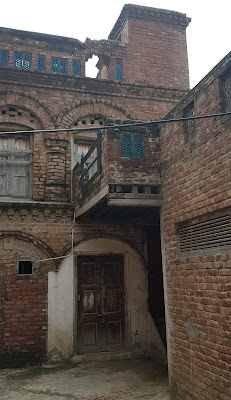 With the partition of India and Pakistan looming, some of the family (especially my dad and two of his brothers) had already moved from Butala village to Indian Punjab. By early 1947, the local Muslims of our village had assure the family of safety, so my Sikh grandparents decided to stay put at the ancestral family home with the two younger boys. 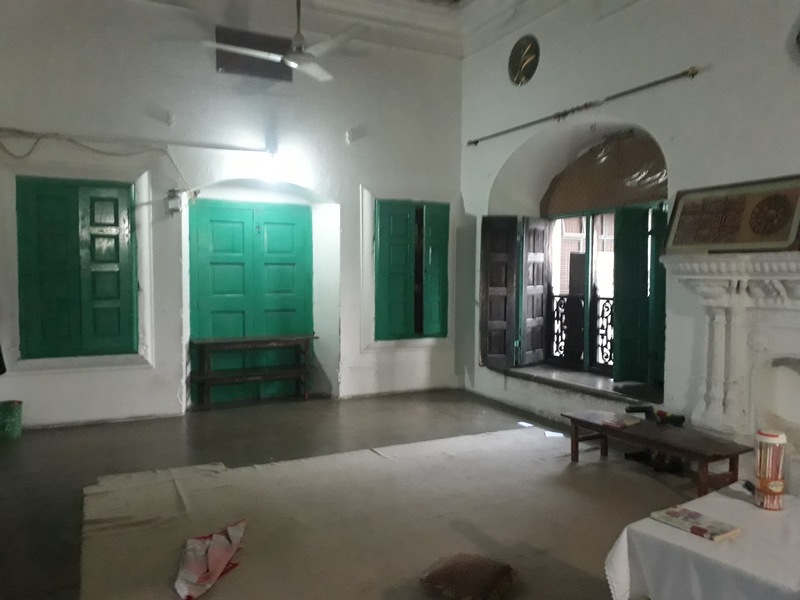 In September 1947, our ancestral home was set on fire by mobs, but the local Muslims saved the house and their lives. In late September, informed by the Muslims that they could no longer ensure their safety, my grandparents decided to leave the village for Indian Punjab. The day they were to depart, a young Muslim man whose grandparents had worked for the family stepped up and demanded that they leave behind everything except the clothes on their backs. At that moment my grandparents, Narinder Kaur and Captain Ajit Singh (retired), realized that they were never to return to the ancestral home where our family had lived for generations. My grandfather wore a round turban similar to a Muslim man, and my grandmother a burqa. Holding their three-month-old son Sarabjit Singh in their arms, and putting two-year-old Narinderjit Singh on a donkey, the Butala Sardars left the ancestral village on foot for good. They walked for several days towards a refugee camp near Gujranwala. When they arrived, the British officer in charge discovered that Ajit Singh had served in army and it took upon himself to facilitate the family's crossing the border. On the way from the camp to the border, a mob of Muslims stopped the vehicle and demanded the family be handed over to them. Upon recognizing Ajit Singh, some of the men in the mob convinced the group to take the family to Lahore and provide them with shelter. It was an incredible change or heart - from mobsters to shelter providers. For several weeks they lived in the home of a Muslim family in Lahore who provided them clothing and food, including non-halal meat. They were dropped off at the border in late October 1947. Tarunjit’s grandparents– Capt. 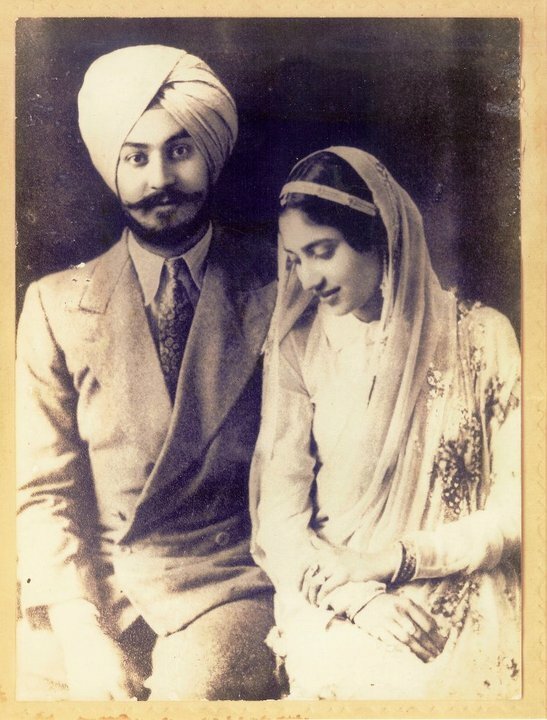 Ajit Singh and Narinder Kaur. I still recollect the terse tone with which my grandmother related this incident to me many times over, with vivid details - sometimes pausing to think hard about what happened then. I once gathered the courage to ask if she felt bitter by the betrayal of the young Muslim man who confronted them on the day they left the village. To my surprise, she said many at that time were not even that lucky, so she was thankful to the young man let them go, even though they had to leave all their possessions. She was particularly grateful to the Muslim family that risked hiding them in their home, facing serious consequences if discovered. This lesson of gratitude even in the midst of such tragedy continues to inspire me. Life does go full circle. With the help of Facebook I am now friends with many of the residents of our ancestral village of Butala in Pakistan. One of them recently shared with me that our ancestral home is now an Islamic School for girls! I treasure the photo of the door to our ancestral home though which my grandparents walked out in 1947, never to return again. I hope to return to Butala someday and walk through it to complete the circle of life that left my grandma with such hope and gratitude despite pain and suffering. Two things impressed me the most in this article. First, the love of Taranjit Singh's grandmother, for his grandson, which actually reminded me of my own maternal grandmother. My maternal grandmother died, when my father was just 10 years old. Second, the family of Captain Ajit Singh, were not bitter towards the people, due to whom they had to leave their home of many generations, but were thankful to those who helped them during this ordeal. This is indeed a lesson for all of us. I am thankful to Mr Tarunjit Singh, that when I contacted him through email, he not only gave answers to my questions but also shared the subsequent history of his family with me. He informed me that the havelis were built during 1880 - 1890, by the families of Jhanda Singh and Ganda Singh. The Samadhi just outside the village also belong to one of them. The Baradari too was built probably at the same time, by his family. Following is the updated history of Butalia family, in the words of Mr Tarunjit Singh. In the early days of Islamic rule in India, prior to the arrival of Mughals, an ancestor of Sardar Dhanna Singh (the family patriarch) is said to have visited Pak Pattan in the 13th century to obtain the blessings of Baba Fariduddin Ganjshakar by preparing langar (which means free public kitchen in Persian). He was blessed by Baba Farid with the title of ‘Bhandari’ or ‘Keeper of Storehouse”. This title of “Bhandari” has been with the family since then and is documented in early records of the family, especially during the early reign of Maharaja Ranjit Singh. The family resided at Kunjah and is also referred to as “Kunjiah” in early records of the Khalsa Darbar. During the reign of Maharaja Ranjit Singh, the family accumulated 42 jagirs (list of these jagirs is available in British Library). 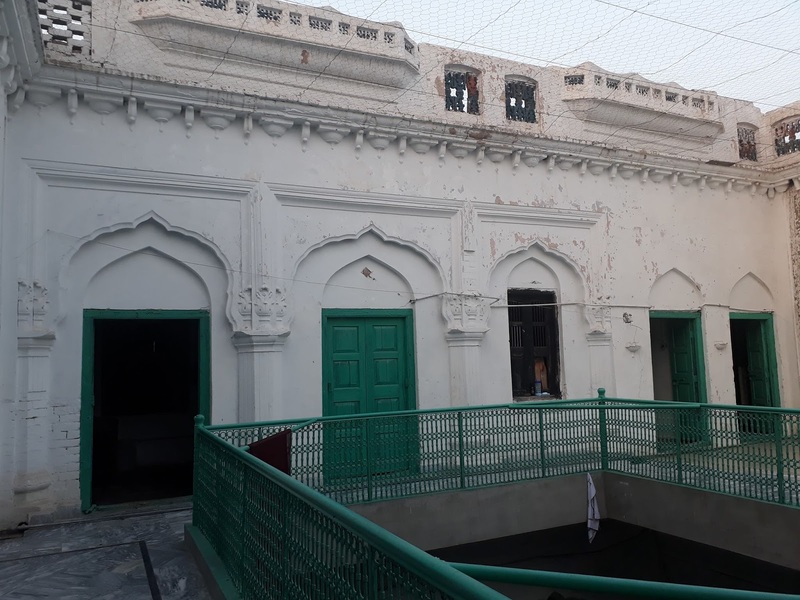 “Batali” in Punjabi language means 42 and hence the family village was referred to in the late reign of Maharaja Ranjit Singh as Butala, now a small village situated about twenty five kilometres west of present day Gujranwala, Pakistan. The family name of “Botalia” or “Butalia” thus became common. The history of the family dates back to Dhanna Singh, who was a well-known associate of Sardar Naudh Singh, the great-grandfather of Maharaja Ranjit Singh. He was present on March 29, 1748, on Baisakhi day at Siri Durbar Sahib, Amritsar, along with Sardar Naudh Singh Sukerchakia, when the eleven Sikh Misls were formally recognized and organized. He continued to serve under Sardar Charat Singh Sukerchakia who gave him the town of Kunjah as a Jagir. In 1764, when Ahmad Shah Abdali invaded Punjab, Dhanna Singh fought alongside Charat Singh. He died in 1765, leaving two sons Diwan Singh and Hiba Singh. Both sons followed the fortunes of the Sardar Charat Singh and when he came into possession of Gujranwala District, both brothers came in to share the Jagirs receiving several villages including Pahladpur and Kalsian. In 1783 when Sardar Mahan Singh Sukerchakia, father of Maharaja Ranjit Singh, obtained possession of Rasulnagar, near the river Chenab from the Chatthas, he assigned an allowance of 1,000 rupees per annum from the salt mines to Diwan Singh. He continued to serve under Maharaja Ranjit Singh after the death of Sardar Mahan Singh. Contemporary historical records show that he was dispatched by Maharaja Ranjit Singh to conquer the fort of Naraingarh. He died 1806, in the attack on Naraingarh fort, on the first night of the attack. Diwan Singh was survived by five sons, of which two (Dharam Singh and Sham Singh) continued to serve under Maharaja Ranjit Singh. Sardar Dharam Singh, was the second eldest son of Sardar Diwan Singh. He served under Maharaja Ranjit Singh in the campaigns of Multan, Kashmir and Peshawar. In 1814, he was sent by the Maharaja to Attock, as co-commander of 2,000 mounted soldiers to attack the army of Yaar Mohammad Khan. His valour at the battle of Multan in 1818, has been memorialised in the poetry “Fatehnama Guru Khalsa Ji Ka” by contemporary writer Ganesh Das. On his retirement the Maharaja gave him a Jagir and a cash pension of 2,000 rupees, placing his son Ganda Singh with Kanwar Sher Singh, who also gave him a Jagir worth 3,000 rupees. He died in 1844, leaving two sons Ganda Singh and Hari Singh. f) He worked to reconcile the differences between Raja Hira Singh and Raja Suchet Singh in early 1843. 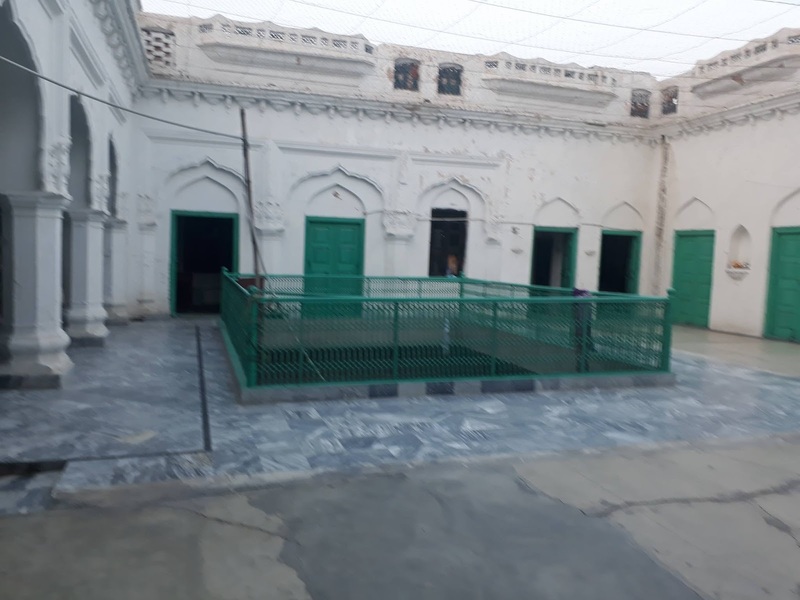 In September 1843, he was with Maharaja Sher Singh at the Shah Bilawal Haveli, when the Maharaja was assassinated by Sardar Ajit Singh Sandhanwalia, whereby he was severely wounded in his effort to defend him. Since then the British spies in Lahore had kept an eye on the activities of Sardar Ganda Singh, due to his fierce loyalty to the Sikh government (e.g. intelligence reports from Lahore dated December 31, 1843 and April 5, 1844). His loyalty to the Sikh state was never questioned, and he served the Lahore Durbar fighting against the British Army. He fought at battle of Mudki (December 18, 1845) and then at the battle of Ferozeshah three days later. During the battle of Ferozeshah, his sowars were a part of the mounted Fauj-i-Ain, with howitzers and guns. During the battle, he was sent by Raja Lal Singh to chide the officers of the Fauj-i-Ain for their failure to control their men. He achieved martyrdom at the battle of Ferozeshah on December 21, 1845, where he died fighting against the British Army, while his son Kirpal Singh was also wounded. His martyrdom is recorded in history in several sources: a) famous eye-witness and contemporary account “Waqai-I-Jang-I-Pheroshahr” of Dewan Ajudhia Parshad, b) Jangnama Vijay Vinod of Kavi Gawal Bhatt (verses 179-193), and c) legendary Janganama Lahore of Bhai Kahn Singh Bangaivalae (verses 243, 299). The sowars of Sardar Ganda Singh continued their battle against the British at the battle of Sabraon in February 1846. The four sons of Sardar Ganda Singh jointly enjoyed a Jagir income of 10,000 rupees per annum, secured to them under the order of the Supreme Government in 1850. It was made up of revenues of eleven villages in tehsil Daska, Sialkot, and two villages in Gujranwala, all now in Pakistan. Sardar Kirpal Singh, born in 1832, was introduced to the young Maharaja Duleep Singh by his father Ganda Singh, who obtained for him a Jagir worth 12,000 rupees, however the Jagir was reduced to 6,000 rupees, during the short premiership of Raja Lal Singh in 1845. 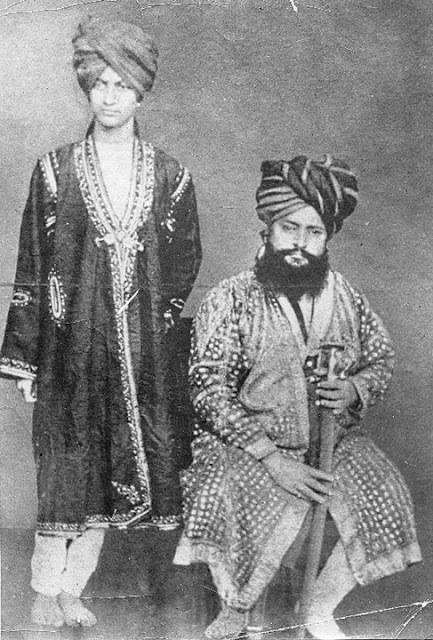 During the Multan rebellion of 1848, he was stationed with his regiment at Hazara, remaining loyal to the British, acting under the orders of Captain James Abbott while his younger brother, Dayal Singh (1827-1909), was in Lahore in attendance on the young Maharaja Duleep Singh. He mostly resided at Kunjah, becoming a Divisional Durbari and died without issue in 1901. A further Jagir worth 7,960 rupees was awarded to Kirpal Singh by Maharaja Duleep Singh in 1847. He adopted his great-nephew Raghubir Singh, who was the son of Sardar Godham Singh. Sardar Partab Singh, born in 1837, was the third son of Sardar Ganda Singh. He served as a Provincial Durbari and was the Extra Assistant Commissioner of Punjab at Butala, with salary of 9,600 rupees per annum. He was bestowed the title of “Sardar Bahadur” by His Excellency the Viceroy and Governor-General of India in 1903, to celebrate the coronation of King Edward II as Emperor of India. 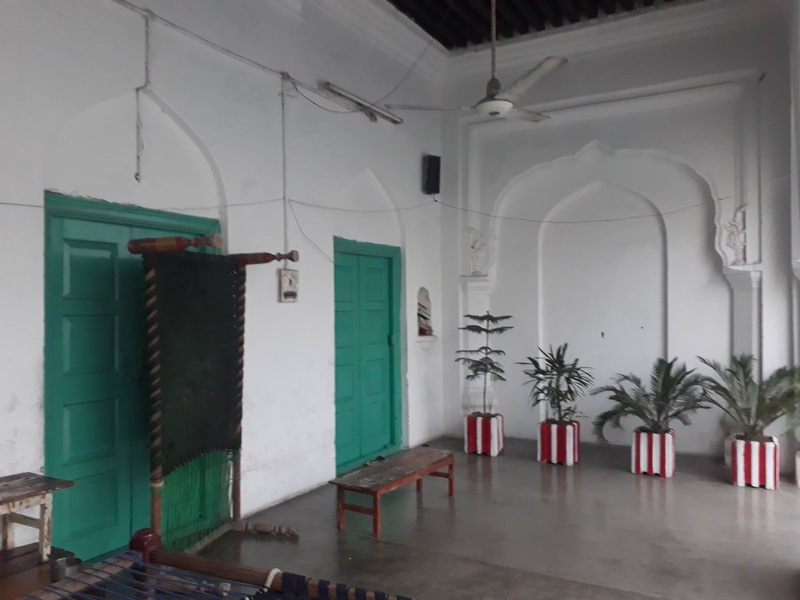 He lived at Butala but also owned the village of Sajada in Hafizabad tehsil, part of Naushera in Sialkot District, and several irrigated plots in Gujranwala and in the Wazirabad tehsil. In addition, he owned fourteen square miles of land on the river Jhelum, which provided him with an annual income of 5,000 rupees. Along with his only son Sardar Godham Singh, they both passed away in 1905. He was survived by his four sons, Raghubir Singh, Bahadur Singh, Budh Singh and Sudh Singh. Sardar Godham Singh, the only son of Sardar Partab Singh, was born 1861. He died in 1905 and was survived by four sons. Second and third sons were Sardar Bahadur Singh (1892-1918) and Sardar Budh Singh (1894-died) Honorary Magistrate First Class and Sub-Judge at Butala in 1930s. Sardar Bahadur Singh, born in 1892, was the second son of Sardar Godham Singh. He made significant financial contributions to the British Government during World War I. He died at Faridkot in 1918, and was survived by his sons; Ajit Singh and Ajinder Singh. Sardar Budh Singh, born in 1894, was the third son of Sardar Godham Singh. He first served as Honorary Magistrate First Class and Sub-Judge of Butala and then as Aide-de-Camp to His Highness the Raja of Faridkot. He had two sons; Harcharan Singh, who served along with Canadian and Indian troops in Italy in 1944, and Mahesh Inder Singh, who was survived by daughter Preneet Kaur and son Jasjit Singh. Sardar Ajit Singh,born in 1913, was the eldest son of Sardar Bahadur Singh. When he was two years old his mother died and his father remarried thereafter. He attended Queen Mary’s Preparatory School in Lahore from 1919 to 1923, and later Aitchison College, Lahore, till October 1931. He graduated with a Diploma and was active in the Boy Scouts, Cadet Corps (Cavalry), Polo, and served as Lance Corporal in his final year. He then went to Guru Nanak Intermediate College, Gujranwala in 1931. Later, he was interviewed by the British Army in 1932, and asked by the British officer why he wanted to join. His response was that his family had served the Lahore Durbar with honour for generations, and fought against the British where his ancestor was killed at battle of Ferozeshah. Now that the British had defeated the Sikh Empire, he was there to serve the British army – a response that was much appreciated by the recruiting officer as being honourable. He joined Indian Military Academy in Dehradun on March 1, 1933, for its second batch. While at the academy, he served as the Military Guard for Governor General of India-the Earl of Willingdon (1886-1941), during his visit to the academy in November 1934. He graduated on 21 December 1935, from the academy and his portrait hangs today at the entrance to the academy’s main dining hall. He was commissioned into the British Army, as a 2nd Lieutenant on 1 February 1936. In the same year, he married Sardarni Narinder Kaur Sodhi of Guru Harsahai in Ferozepur District, and his IMA colleagues Sam Manekshaw (future Field Marshal of Indian Army) and Ayub Khan (future Commander-in-Chief of the Pakistan Army) attended the wedding. After one year of attachment with 2nd Battalion of the Border Regiment, he was posted to Jabalpur with 3rd Cavalry in February 1937. He was posted in Agra in 1938, and left the army in 1939, returning to his ancestral village of Butala. He briefly returned to the army in 1941, with the 8th Cavalry at Ambala, falling sick he finally left the army retiring at Butala. With the Partition of India and Pakistan looming, some of his family (especially the three older boys Karamjit Singh, Daljit Singh, and Manjit Singh) had already moved from Butala village to Indian Punjab. 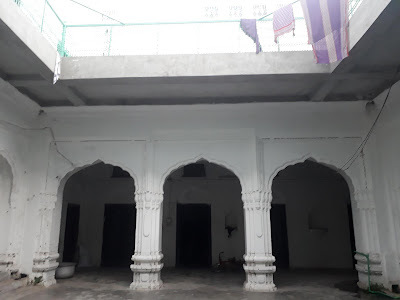 By early 1947, the local Muslims of Butala village had assured the family of safety and so Ajit Singh decided to stay at Butala with rest of his family. In September 1947, the ancestral house was set on fire by mobs but the local Muslims saved the house and their lives. The local Muslims were no longer able to protect the family that had lived in their village for generations. Finally in late September, the family decided to leave the village for Indian Punjab. The day they were to depart, a young Muslim man who grandparents had worked for the Butalia family stepped up and demanded that they could not take anything with them except the clothes on their back. It was at that moment Sardarni Narinder Kaur and Ajit Singh realized that they were never to return to their ancestral home where his family had lived for generations. Ajit Singh wore a round turban similar to a Muslim man, Narinder Kaur a burqa, holding their 3 month old son Sarabjit Singh in her arms, put Narinderjit Singh on a donkey and the Butala Sardar left the village on foot never to return. The family walked several days towards a refugee camp, near Gujranwala, when they arrived, the British officer in charge discovered that Ajit Singh had served in the army and took it upon himself to facilitate his family across the border. On the way from the camp to the border, a mob of Muslims stopped the vehicle and demanded that the family be handed over to them. Ajit Singh recognized some of the men in the mob and they decided instead to take the family to Lahore and provided them with shelter. For several weeks they lived in the home of a Muslim family in Lahore, providing them with clothing and food (including non-halal meat). They were dropped off at the border around late October 1947, on arrival in India, Ajit Singh was allocated a house in Faridkot, later joining the police force of Maharaja Harinder Singh of Faridkot. He died in 1955 in Ferozepur, and was succeeded by his five sons, Karamjit Singh, Daljit Singh, Manjit Singh, Narinderjit Singh, Sarabjit Singh and a daughter, Jasjit Kaur who had died due to disease at a young age. 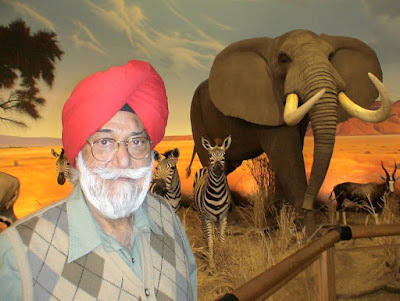 Sardar Karamjit Singh, born in Jabalpur in 1937, was the eldest son of Sardar Ajit Singh. He attended Aitchison College, Lahore, but before the Partition, was moved by the school to an alternative school in Indian Punjab in 1946. He joined the Territorial Army of India and was stationed in Ferozepur, Chandigarh, and Ambala and served in the army at the border during the Indo-Pak wars of 1965 and 1971. During his tenure in the army, he was considered to be an avid hunter especially of partridges, wild boar, and deer. His friends fondly remember him as a “best friend of friends”. Upon being released by the army, he joined the Thapar Group and was posted at Tarn Taran during the infamous Operation Bluestar of 1984. He then continued to live primarily at Vasant Kunj in New Delhi. He died in Chandigarh in 2008, while attending the wedding of Angad Singh, the elder son of Bhai Jujhar Singh, the Bagrian Sardar. In 1963, He married Tripat Kaur and had two children, daughter Harjeet Kaur and son Tarunjit Singh. His brother Sardar Daljit Singh has a daughter Amanjeet Kaur and son Arunjit Singh. Sardar Manjit Singh has daughter Harjit Kaur and son Gurjit Singh. Sardar Narinderjit Singh has two sons Bikramjit Singh and Giteshjit Singh. Sardar Sarabjit Singh has twin sons Bikramjit and Samarjit Singh. Sardar Tarunjit Singh, born in Chandigarh in 1965, was only son of Sardar Karamjit Singh. He did his Bachelor’s Degree in Civil Engineering from Punjab Engineering College, Chandigarh in 1987, and Master of Science Degree from the Indian Institute of Technology, Mumbai in 1989. After a short stint at National Thermal Power Corporation in Delhi, he went to the United States. He completed his Ph.D. in Civil Engineering in 1997, at the Ohio State University, where he now works as a faculty member. He is an interfaith activist well recognized for international and local interfaith achievements. He has worked with the Interfaith Association for Central Ohio for over 20 years and is co-editor of the landmark book Religion in Ohio: Profiles of Faith Communities. Nationally, he is a founding trustee of the Sikh Council for Interfaith Relations, member of Board of Trustees of the Council for a Parliament of the World's Religions, as well as serves as a Special Advisor with Religions for Peace – USA and is its former Moderator. 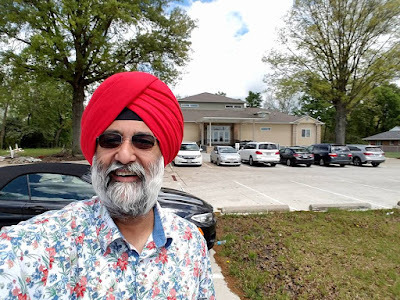 He also is a Board member of the North American Interfaith Network and has served on the board of the National Religious Coalition Against Torture as well as the World Sikh Council – America Region. In June of 2005, he participated in a “Critical Moment in Inter-religious Dialogue” conference organized by the World Council of Churches in Geneva, Switzerland. At the conference, Dr. Butalia moderated a session and discussion on dialogue and action. In January 2006, he helped organize the first National Gathering of Religious Leaders in Chicago presented by Religions for Peace – USA, and shared perspectives on the role of religious leaders in the 21st century. In August 2006, Dr. Butalia participated in VIIIth World Assembly of Religions for Peace held in Kyoto, Japan on the theme “Confronting Violence and Advancing Shared Security.” He has helped to facilitate the Catholic-Sikh National Consultation with the US Conference of Catholic Bishops. In October 2011, he represented the Sikh Faith at the 25th anniversary of the World Day of Prayer for Peace hosted by Pope Benedict XVI at the Church of Saint Francis of Assisi, Italy. In May 2004, he received the inaugural Living Faith Interfaith Award from the Columbus Metropolitan Area Church Council, Ohio, US. His interfaith efforts have been showcased nationally on the Hallmark Channel. In 2016, he was received the Luminosa Award for Unity by the North American Focolare Movement, which was founded in Italy in 1943. Sardar Tarunjit Singh has three children; daughter Jasjit Kaur (1996-) named after the sister of Sardar Karamjit Singh who passed away when she was very young, Simranjit Kaur (2000-) and son Sukhjit Singh (2005-). Tarunjit Singh’s elder sister Sardarni Harjeet Kaur has two daughters Neha Kaur (1983-) and Nadisha Kaur (1985-). Sardar Sukhjit Singh, was born in Columbus, Ohio - USA in 2005. He is only son of Sardar Tarunjit Singh and has a passion for sports and hunting, like his grandfather. He is currently studying at Karrer Middle School in Dublin, Ohio, USA. Sardar Sham Singh, born in 1786, was the youngest son of Diwan Singh’s five sons. He was summoned by Maharaja Ranjit Singh to Lahore and confirmed upon him some of his late father’s possessions and estates. He rapidly rose to power, and received vast Jagirs which amounted to about 50,000 rupees. But when he was killed at the battle of Attock in 1813, the Maharaja treated his young son Jhanda Singh with great affection and kindness exchanging his Jagir at Kunjah in the Jhelum District, with that of Sahari in the Sialkot District in 1819. Of the numerous chiefs that had served at the Court of Maharaja Ranjit Singh, was Sardar Jhanda Singh. His first military service was in Kashmir, where Diwan Lakhpat Rai and Mirbaaz Khan had caused some trouble with the administration. He also accompanied the Maharaja in the campaigns to Mankera and Dera Ismail Khan (both now in Pakistan) which was taken in 1821 and for his gallant services received valuable gifts. In Sir Lepel Griffin’s version of the Punjab Chiefs (1865), he mentioned an interesting anecdote, that around this time he married his sister to Sardar Sher Singh, the sum of 100,000 rupees was spent on the occasion by either party that never did such a splendid marriage had ever taken place in Gujranwala District. When the mother of Sardar Jhanda Singh had boasted of possessing two large baskets of rupees, the Maharaja, who had heard of the festivities sent a message to both Sardars’ Hukam Singh and Jhanda Singh, that as they can afford to spend so much on the wedding, they must each find it convenient to pay 50,000 rupees for the good of the State! Sardar Jhanda Singh chiefly served in the Trans-Indus region of the kingdom, manly in Akora Khattak, Peshawar and Jahangira. He was a man of energy and ability, and the Maharaja showed his appreciation of his loyal character by giving him the charge of Hazara, under the guidance of General Hari Singh Nalwa, probably one of the most unruly provinces of the country. He was appointed in-charge of the fort built by Sardar Hari Singh Nalwa on the bank of the river Barha, which he commanded with 300 infantry, 100 cavalry, and 3 cannons. His services were numerous and important and under the orders of Prince Nau-Nihal Singh, the villages of Butala and Pahladpur was granted to him and heirs in perpetuity. In 1836, he accompanied Prince Nau-Nihal Singh in his campaign to the Derajat region. He was at the battle of Jamrud of April 1837, in which Sardar Hari Singh Nalwa was killed. During the Kabul expedition he was the acting Governor of Attock fort and was able to provide assistance to the invading British Army in the way of supplies and carriage. However, the fortunes of Jhanda Singh was not much disturbed after the death of Maharaja Ranjit Singh and when Maharaja Sher Singh ascended the throne in 1841, his influence at court rapidly increased as did his Jagirs. On the brief premiership of Raja Jawahar Singh, he was promoted to Chief Justice of Lahore in conjunction with Diwan Hakim Rai till 1846. The following year he was dispatched to Hazara again, as Deputy Governor under Sardar Chattar Singh Attariwala. Later in the same year, he was bestowed with the honorary title of ‘Bahadur’ on the suggestion of the Resident, Caption James Abbott (1807-1896). In May 1848, soon after the outbreak at Multan, it was determined by the authorities to send a Sikh force to Multan to aid in drawing a cordon round the city to prevent the spread of the rebellion in which Jhanda Singh was specially selected to command this force. His conduct was most admirable and Captain Abbott wrote in high terms of him to his superiors back in Lahore. Yet, barely some time later, he was suspected to be in league with the rebels and Captain Abbott doubting his loyalty recalled him back to Lahore much to his disappointment. His influence over Sardar Chattar Singh Attariwala, the Governor of Hazara was very great. When the Governor was becoming insubordinate in his duties, Jhanda Singh was sent to Hazara along with a confidential agent of Captain Abbott to remind him of his duties but was unsuccessful. 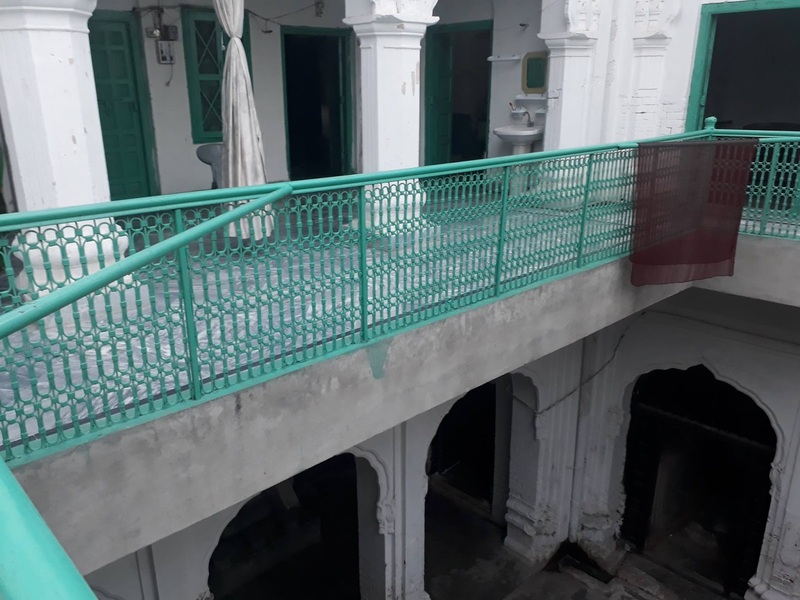 This further widened the Resident’s mistrust on Jhanda Singh’s actions where the best men were usually suspected of colluding with the enemy, and so he was again recalled to Lahore and arrested. On his release, during the final months of the war, he was again reinstated and his cavalry was ordered to maintain an open vigil between Ramnagar and Lahore to which he performed with such dignity and admiration. Of his duplicity or connivance with Sardar Chattar Singh was never proved on his part, because another stronger influence had been urging that chief (Chattar Singh) to rebel. On the annexation of the Punjab, his personal estates and Jagirs which amounted to 15,000 rupees was confirmed in perpetuity. He was appointed a Magistrate in 1862, and possessed considerable influence in the Gujranwala District. Known to be as a liberal and enlightened gentleman who spent well over 25,000 rupees from his own pocket on public bathing tanks, temples and on other benevolent works. His eldest daughter was married to Sardar Sher Singh, who was the son from the old Sikh aristocracy, General Hukma Singh Chimni. He himself was married into one of the oldest aristocratic families of Punjab, the daughter of Sardar Gurmukh Singh Lamba, the childhood friend of Maharaja Ranjit Singh. He died of old age in 1883, much to the regret of the local classes of his district. He was succeed by his three sons, Nihal Singh, Mehtab Singh and Mul Singh. Sardar Nihal Singh, the eldest son of Sardar Jhanda Singh, was promoted as a commandant of the cavalry in the Charyari Regiment under Prince Nau-Nihal Singh. He was confirmed a Jagir worth 3,500 rupees in Kot Shah Muhammad, located now in Gujranwala District, Pakistan. He had married the daughter of Sardar Attar Singh Dhariwala and suddenly died in 1864. 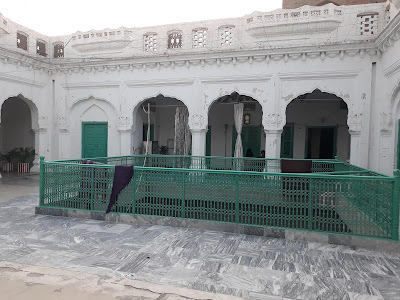 His younger brother Mehtab Singh received a pension of 500 rupees per annum, with the exception of the Jagirs of Butala and neighbouring Pahladpur, worth about 1,500 rupees which were held in perpetuity and died just three years after his father’s death in 1886. His other brother, Sardar Mul Singh, became a Tehsildar, on a salary of 3,000 rupees per annum. He contributed financially to the First World War and received a pension of 3,000 rupees from land he acquired in the Gujranwala District. In addition, he owned 20 squares of land in the Jhelum Canal which he had bought for one lakh rupees. He died in 1919. Sardar Bakhshish Singh, born in 1877, was the son of Sardar Mul Singh, who had recruited a considerable number of men during the First World War. He was a Member of the District War League and made good collections for the War Loans. He contributed 6000 rupees towards the War Loans, and his offer for the Aeroplane Fleet was graciously accepted by the British Government. He lastly, served as Tehsildar and Revenue Officer for 25 five years. He was entitled to receive land revenue from Nanakkote village and possessed a certificate which included him in the category of Sardars and Jagirdars. Like his father, he contributed financially during the First World War and was appointed Patron of the District Sikh Sudhar Committee at Gujranwala in 1925. He also rendered monetary help for the Flood Relief Fund through the Red Cross Society in 1930, receiving a first-class Sanad. His philanthropic contributions included erecting Gurdwaras in his district, and established Primary and Middle girls' and boys' schools at Nanakkote and Butala. His donations included, 500 rupees to the Prince of Wales Reception Fund in 1922 and 400 rupees to the Royal Silver Jubilee Fund in 1935. 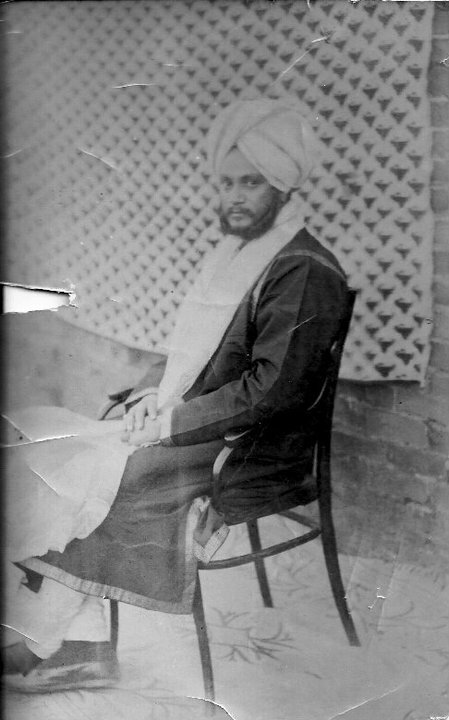 Awarded the title of 'Sardar' in 1921, and a seat in the Divisional Durbar in 1922, receiving a Sanad from the Punjab Government in 1923, for assistance to the cause for education. Lastly, he was enrolled for humanitarian services as Life Member of the Red Cross Society in 1923. He had two sons, Moti Singh and Mahabir Singh. Sardar Balwant Singh, born in 1850, was the son of Sardar Nihal Singh, and inherited a grant worth 1,200 rupees from his grandfather’s estates in the Gujranwala District. He owned vast estates in the district, including 2000 acres of prime land which yielded an annual income of 1,500 rupees and founded the villages of Qila Balwant Singh and Qila Mul Singh in present day Gujranwala District, Pakistan. Like his grandfather, he was liberal in spending money on charitable causes and opened a dispensary at his own village of Butala. For many years he was an Extra Judicial Assistant Commissioner in the province as well being the only second Provincial Dubari in his district and prior to his retirement in 1908, was a District and Sessions Judge. He had set up a society which was registered under the societies Registrations Act of 1860, to look after the education of needy boys, girls and women. The school came into existence in 1908 f0llowing the first Sikh Education Conference at Gujranwala under the name of lstry Sahayak Vidyalya. But after the Partition of 1947, the institution shifted to Karnal (Haryana) and was renamed after its founder as Sardar Balwant Singh Modern High School. It was affiliated to C.B.S.E. in 1985, and the institution owes a debt of gratitude to its illustrious founder who visualized the importance of education as a tool to success for the removal of ignorance and poverty. He was a great patriot and visionary who dedicated nearly 700 acres of land out of his personal estate for the trust to be set up by him. 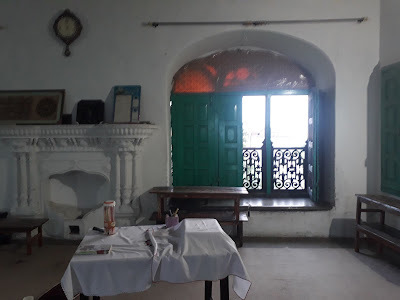 He was compassionate for the poor and as per his will dated 8 August 1912, several widows received a subsistence allowance of 300 to 700 rupees per month irrespective of their caste or creed. On his death in 1915, he had no issue but two sisters. The youngest sister, married Diwan Gurujith Mal Chopra and they had one son Diwan Sarabdayal Chopra (1887-1956). Of his four children, the eldest son, Dr Surinder Nath Chopra, married Delphia Elizabeth Williams of Edinburgh and their children are; Sheila Chopra, Pamela Chopra (1933-2016) and Ian Chopra. His youngest son, Diwan Kuldeep Chopra lives in Karnal, and has three children; Iqroop Chopra, Bikram Chopra and daughter Bandna Chopra. List of those 42 (Batali or bitali) jagirs, which gave this family their name. "Heyguran" probably had two parts. I could locate only 20 of the 40 places. Actually, the change in spellings has made it even more difficult to locate those places. In the beginning I thought that I would not be able to give much information about the people who built these havelis, but at the end I found more information than best of my expectation. For that, I am really indebted to Mr Tarunjit Singh Butalia, who was very helpful and gave me all the information I needed. He also most kindly allowed me to use the pictures of his family. However, he could not clarify one question in my mind. 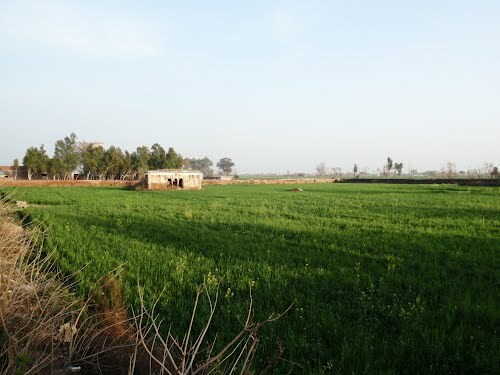 There is one village in the same Gujranwala district and its name is Butala Sharm Singh, just southeast of Gujranwala city. According to Mr Taraunjit Singh, their family has now connection with that place. If so, then whay that place is called 'Butala' Sharm Singh? The following maps shows some places mentioned in the article. The names of jagirs are marked in Yello. 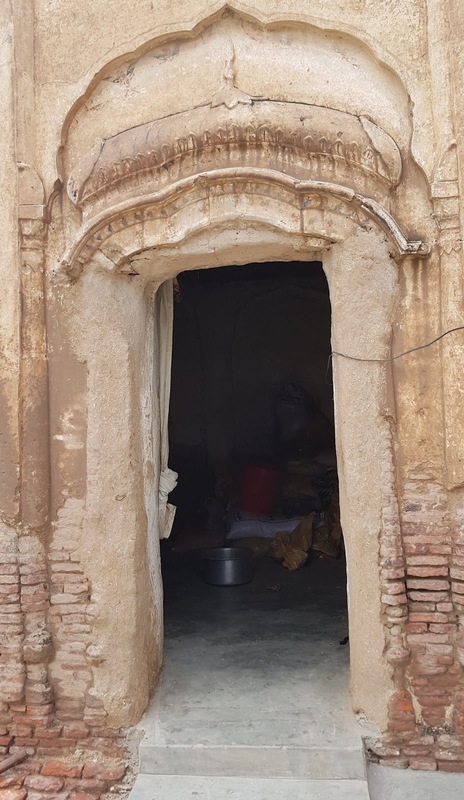 At the end, I would like to express my wish that it would be great, if we could preserve these havelis, which are an important relics of a historical era and a good speciment of the old architecture of this region. But I see little chance of happening that and perhaps in a few years. everything will vanish forever. 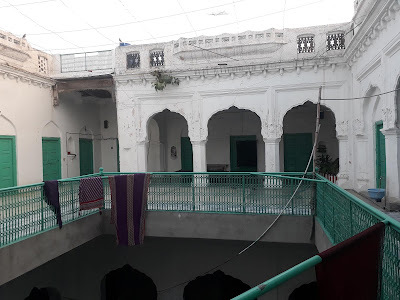 As I mentioned above, due to certain reasons I could not enter the main haveli (referred to as Haveli B). Later on I regretted my haste and not trying enough. 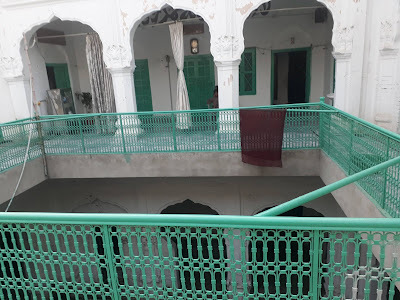 But here again, Taranjit Singh Ji came to my help and provided me the pictures of the interior of this grand haveli. He obtained these pictures through some of his local friends. Tariq AmirNovember 29, 2018.Doha - Qatar.